with cloisonne, art glass or Bali silver Our Fathers. 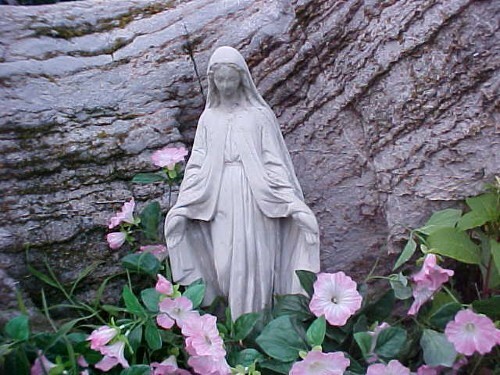 Because He has looked upon the lowliness of His handmaid. I think of these designer rosaries as my gift to Mary of the Magnificat, to the glory of God, and so I have searched for the most beautiful rosary beads and highest quality sterling silver rosary components that I could find to honor the Queen of Heaven. I prefer to make my rosaries with semi-precious gemstones and freshwater cultured pearls, because natural gemstones and cultured pearls are God's own art work, and they remind me of what the priest says at the Consecration, "which earth has given and human hands have made". I have been designing handmade rosaries since 1992, when I became Catholic. As a new Catholic, I wanted a rosary that I could tell the difference between where to say "Hail Mary" and where to say "Our Father". I couldn't find what I was looking for, so I decided to try making my own. So many people who saw my rosary wanted me to make one for them. These sterling silver wire wrapped rosaries are intended to be heirloom rosaries, made to last to be passed down, as our Catholic faith has been passed down, from generation to generation. These unique Catholic rosaries, made with 7x8mm side drilled "potato" shape White Fresh Water Pearls (also available in Peach, Ocean Blue or Golden Sand Freshwater Pearls) combined with Hill Tribes Fine Silver beads and findings made entirely by hand, are a reminder that even when we are on vacation, enjoying surf and sand, fishing and collecting sea shells, we are a people called to prayer. In place of a traditional crucifix, I have used a Hill Tribes Fine Silver pendant with an elaborate cruciform design, and in place of the center medal, I have used a Hill Tribes Fine Silver "puff" shell. If you prefer a more traditional crucifix and center, please see the Stella Maris rosary below. All beads and links are wire-wrapped with Sterling Silver wire. $286. NOTE: THIS ROSARY IS ONLY AVAILABLE IN THE WIRE WRAPPED VERSION. Dedicated to Our Lady under the title "Stella Maris" (Star of the Sea), this unique rosary is a more traditional version of my best selling "Sea Treasures" rosary shown directly above this one. Some clients wanted a crucifix on their rosary and none of the stock crucifixes and centers would look right with it, so I searched for a set that is in harmony with the hand made Hill Tribes Fine Silver sea shell and fishes Our Father beads, and found this lovely set which is a Sterling Silver hand cast reproduction of antique rosary components from the Phillipines. Shown with side drilled "potato shaped" Peach Fresh Water Pearls, this rosary is also available with White Fresh Water Pearls, Ocean Blue Freshwater Pearls or Golden Sand Freshwater Pearls. The potato shape pearls vary in size and shape. This rosary is available wire-wrapped with sterling silver wire for $378. The Phillipines heirloom reproduction crucifix and center are available only as a matched set and only by special order. Visit my designer collections to see some of my exclusive designs. Here you will find the finest quality sterling silver rosaries, gemstone rosaries, crystal rosaries, and fresh water cultured pearl rosaries with exquisite hand crafted sterling silver beads and caps, cloisonne, lampworked art glass and carved gemstones used for the Our Father Beads. Many of my designer rosaries feature deluxe rosary components - distinctive crucifixes over 2 inches long and center medals an inch or more long. My sterling silver rosaries are handmade with die cut satin finished and hand engraved sterling silver crucifix and center medal, sterling silver chain, and linked with specially hardened sterling silver wire. My designer collections include some heirloom collectable rosaries with special sterling silver components hand cast from antique parts. These special heirloom rosary components are available only by special order. Most of my rosaries feature multiple part Paters (Our Father beads). Some Paters actually consist of 9 separate beads, caps and spacers! Wire wrapped rosaries look similar to standard linked rosaries, but instead of simply closing a loop, the wire is wrapped around itself at the base of the loop so that it cannot come open. Wire wrapped rosaries use twice as much sterling silver wire as standard linked rosaries, and it takes eight hours work to make the wire wrapped rosaries, which is why they are more expensive. See a close-up picture of what wire wrapped links look like on the Contact - Order page. I NO LONGER MAKE BEADED ROSARIES. My gemstone rosaries feature a variety of semi-precious stones: Lapis Lazuli, Rose Quartz, Turquoise, Hematite, Garnet, Amethyst, Jasper, Jade, Agate, to name a few, are among the many stones used on my gemstone rosaries. I have many more gemstones than I have room to show on my website, so if you don't see the rosary beads that you are looking for on my designer rosaries, please inquire. I also make several types of crystal rosaries: My sterling silver crystal rosaries are made with Rock Crystal, Swarovski crystal or Chinese crystal. Rock crystal is natural clear quartz. Swarovski is the most famous brand of leaded glass crystal. Chinese crystal does not have as much lead content as Swarovski, but is a lower price alternative that looks fairly similar. Swarovski crystal and Chinese crystal contain varying amounts of lead and are not recommended for children. Please select Rock Crystal, which I have in all sizes from 5mm - 8mm, for children's rosaries. 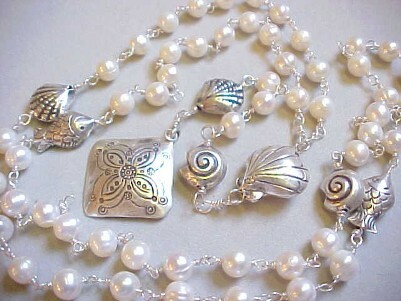 My sterling silver pearl rosaries are made with genuine fresh water cultured pearls. Most freshwater pearls are "potato" shaped, irregular ovals with bumps and wrinkles that give them character typical of freshwater pearls. My AA, A and B grade round freshwater pearls are grown by a process that was developed in Japan for saltwater pearls, producing more uniformly round, smooth and lustrous pearls. The special heirloom rosary components, that are hand cast in sterling silver from antique rosary parts are available only by special order and are not kept in stock. If you would like your rosary made with them, I will special order them for you. If you would like a custom made rosary, I will be happy to consult with you to design a rosary especially for you. 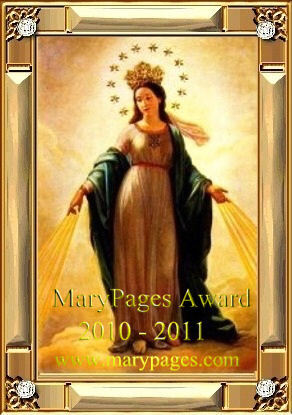 Please allow extra time if you want special ordered heirloom rosary parts on your custom rosary. While I respect the traditions of other faiths, I make only Catholic rosaries. I make First Communion rosaries, Confirmation rosaries, rosary bracelets, Trinity bracelets, decima chaplets and other types of deluxe rosaries, all of which are traditional Catholic gifts. If you need ideas for Catholic gifts, my designer rosaries, as well as rosary bracelets and Trinity bracelets are the perfect Catholic gifts. 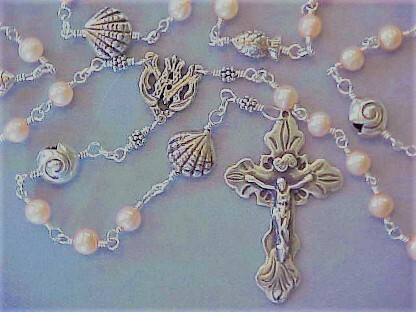 For deluxe rosaries, see my designer rosaries page to enter the ten pages of designer collections. See the Bracelets page for rosary bracelets and Trinity bracelets. First Communion rosaries and Confirmation rosaries may be found on the Special Occasions page. And for less expensive rosaries, be sure to check out the rosaries on my Bronze & Pewter page. I'm sure you will agree that my designer rosaries are truly works of religious art, heirloom rosaries that you will want to hand down in your family for generations. May the beauty of your special handmade rosaries inspire you to pray the Rosary often!